Feature and Follow Friday (2) Which Book Character Would You Trade Places With? 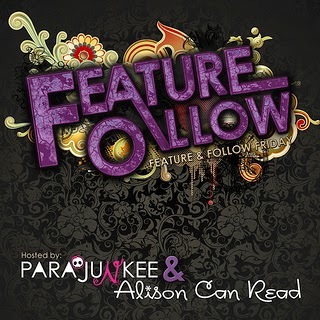 It’s time for Feature and Follow Friday again, a meme hosted by Parajunkee and Alison Can Read. The idea is to make friends and gain new followers, as well as discovering some awesome new blogs to follow yourself. To take part, all you have to do is sign up on the linky below then create a blog post linking back to the host’s post. Then visit as many other blogs on the linky as you can to introduce yourself and follow them, remembering to follow back anyone that follows you! Each week one blog is showcased and this week’s Featured Blog is Words I Write Crazy. It’s required to follow the Featured Blog as well as the host blogs. Be sure to check out the rules if you want to join in. There’s also a different question posed to the bloggers each week. Question of the Week: Which book character would you trade places with? This is a tricky one to answer as a lot of the books I read are from the Dystopian or Sci-fi genres, and I definitely wouldn’t want to trade places with any of those characters! I’m going to pick someone from the Fantasy genre instead, as I’d love to escape into a magical world sometimes. If I had to pick, I think I’d trade places with Hermione. She’s super smart and picks up spells and potions with ease, so it would be great fun to have so much power and go on so many adventures. She gets to spend her school life in the Hogwarts castle with it’s huge magical library and has some brilliant friends-Harry, Ron, Ginny, Luna, Neville, Fred and George. A big bonus is that she gets to use the time-turner! I could spend so much time reading, blogging and watching TV boxsets if I had one of those! Plus she has a Mary Poppins-esque bottomless bag which would be very handy to carry around all my books and snacks. Life would never be dull! Which character would you trade places with? Excellent choice for the time-turner alone! YES HERMIONE. One of the best heroines EVER. She rocks. I love Hermione! She will always be one of my favourite characters! I have seen Hermione around a lot! I agree she is a great character. This was such a great question! Thanks for stopping by my blog, I am an old follower. Awesome choice, I chose Hermione as well. Thanks for following. Following right back. Nice choice 🙂 I am a new GFC Follower so Hi!! That's all so true! Hermione would definitely be a witch to switch places with. An interesting life for sure! Oh yes, she has the time turner. That's part of the reason why I like Prisoner of Azkaban more than any other book in the series. Old Blog Lovin' follower. Thanks for stopping by! Ah, great choice! I didn't even think of her! I have picked Hermione too! I forgot about the time turner! I'm a new bloglovin follower. Smart and magical. Good choice. You can't go wrong with Hermione. The time-turner would definitely be excellent for us bookworms. I love Hermione! Her life is so difficult though. Followed back on Bloglovin! 🙂 Thanks for visiting Cornerfolds! Great choice, I would love to have that time turner myself! Thanks for dropping by! Awesome choice, I love Hermione! Existing Bloglovin' follower! Thanks for stopping by! Happy reading!